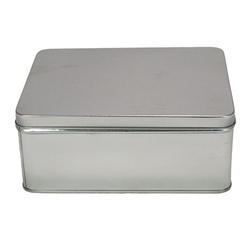 Backed by our able engineers, we have been able to provide an assortment of Small Tin Boxes. Used to fill chemicals, pharma or cosmetic products. Moreover, these are durable in nature and can be unsealed by breaking with the help of hands, also these have good resistance against corrosion. We are engaged in manufacturing products such as tin packing products. We are the Leading Manufacturer of Round StorageTin Box. It will be used for many purposes.